What happens to AR politicians??? As of Tuesday--- AFTER We the People have spoken-- AT THE BALLOT BOX! Don't get back into the reclining position YET! We still have AB 1634 to finish off! Pencil in June 18th to be in the Capitol!!! WASHINGTON, Aug. 2 /PRNewswire-USNewswire/ -- Today the nonprofit Center for Consumer Freedom (CCF) called on the Humane Society of the United States (HSUS) to return all the money it has raised in the wake of the Michael Vick dogfighting scandal. CCF revealed today that beginning on July 18 -- the day after Vick's criminal indictment -- HSUS promised on its website that financial contributions would be earmarked for helping it "care for the dogs seized in the Michael Vick case." But yesterday The New York Times reported that HSUS is not, in fact, caring for the animals. 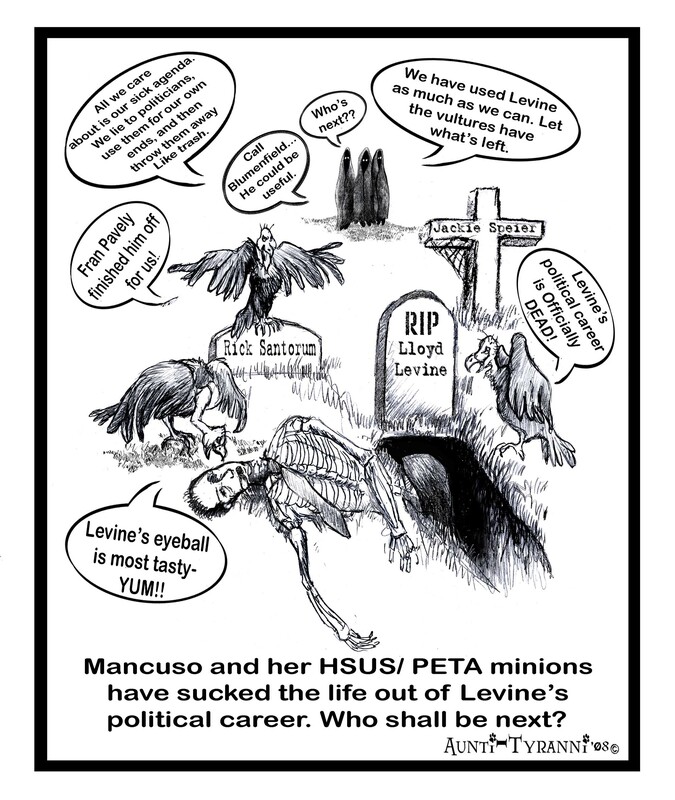 And HSUS president Wayne Pacelle told the Times that his group is recommending that government officials "put down" (that is, kill) the dogs rather than adopt them out to suitable homes. "Like most Americans, we can't stand dogfighting," said Center for Consumer Freedom Director of Research David Martosko. "But we also can't stand animal-rights fundraising that smells this fishy." The Humane Society of the United States is not affiliated with any local "humane societies." Although the organization runs no hands-on dog or cat shelters anywhere, some of its fundraising materials hint at a direct connection with pet rescue operations. 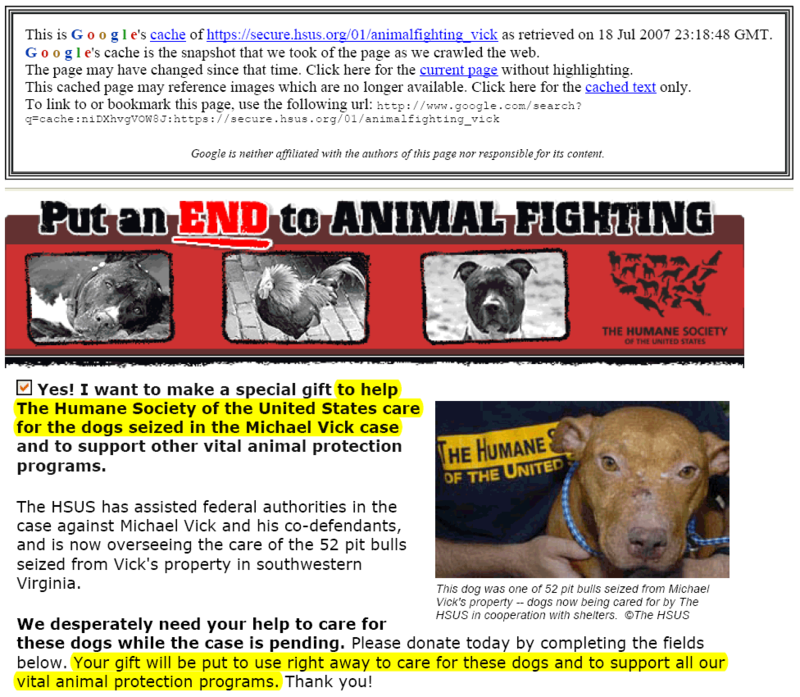 HSUS's online fundraising pitch related to Michael Vick has now been quietly altered to remove the claim that the group is caring for his pit bulls. But there's no reliable way to know how much money the group raised on the basis of its earlier promises. 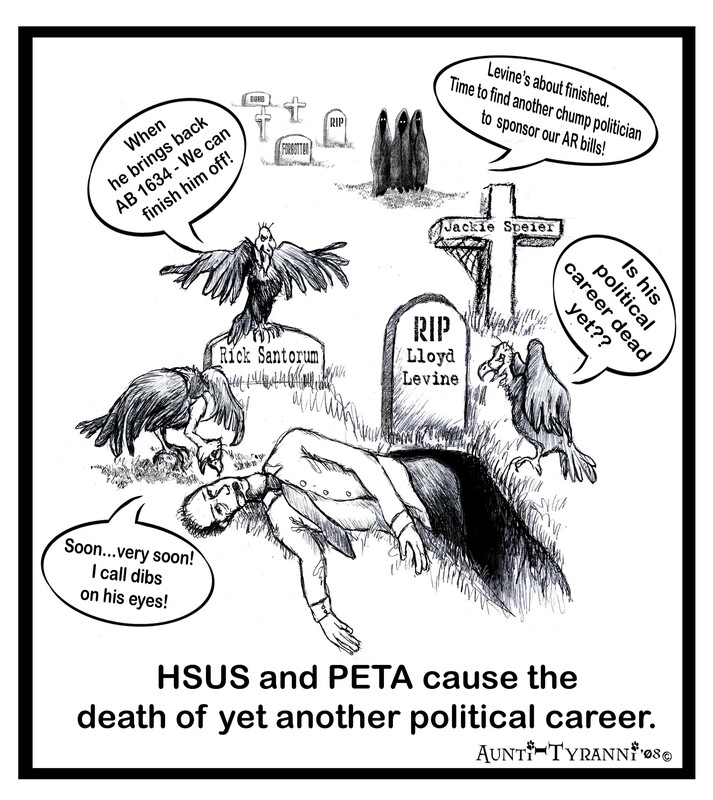 "As usual, HSUS is exploiting Americans' emotions about dogs to build its war chest for anti-meat, anti-dairy, and anti-medical-research campaigns," Martosko added. "These predatory activists should return every cent and apologize for misleading the public." In a similar episode, HSUS raised a reported $32 million in the wake of the Hurricane Katrina disaster, promising to use the funds to rescue and reunite lost pets with their owners. But since March 2006, Louisiana Attorney General Charles Foti's office has been investigating what happened to the majority of those funds, which HSUS does not appear to have used for Katrina- related rescues. For an interview, call 202-463-7112.
personal responsibility and protect consumer choices. Must Cage-Free Be Your Future? The battle is raging over the future of battery cages for the layer business, and it's too early to call who the victor will be. On the one side are powerful animal rights groups such as the Humane Society of the United States (HSUS), which are pressing for an all-out ban on the use of battery cages through legislative efforts and pressuring the marketplace to buy only cage-free eggs. "The egg industry is completely out of step with American's expectations of how animals ought to be treated," says Paul Shapiro, the HSUS's director of the factory farming campaign. "What the industry needs to do," he says, "is to get rid of battery cages." He cites the recent move by Burger King, Wolfgang Puck, and others, in painting a picture of a marketplace responding to consumer wishes for more cage-free egg production. But in the view of Gene Gregory, president and CEO of the United Egg Producers, Altanta, the switch of egg buyers in the marketplace to cage-free is "not at all" due to consumer pressure against battery cages. Rather, he says, companies are making changes in their egg procurement policies "because they are afraid of what they (animal rights groups) might do to them if they don't. They don't want to be retaliated against." In some cases, Gregory says, companies that have switched to cage-free have called United Egg Producers (UEP) and apologized for doing so. Gregory says the HSUS, Farm Sanctuary, and People for the Ethical Treatment of Animals (PETA) "are aggressively trying to force everyone to buy cage-free eggs and they're getting more aggressive all the time." He says he is not opposed to cage-free, and UEP represents producers of cage-free, in addition to organic and conventional producers of battery cage production. But that said, Gregory believes in consumer choiceconsumers should have the right to buy whatever eggs they want rather than be forced to a specific purchase. Gregory's view is that animal care standards should be science-based and to that end, UEP has established its certified program in which a qualifying producer's operations conform to UEP animal care guidelines, subjected to an annual third-party audit. This program features a trademarked seal approved by the Federal Trade Commission and USDA that producers can place on their egg cartons if they adhere to the UEP Certified guidelines. But to Shapiro, UEP's guidelines are inadequate, and do not allow for birds to lead healthy and normal lives because they are cage-bound. "Cage-free systems are not perfect, but they allow animals to engage in nesting, areas for them to walk, perch, all important for birds to engage in." Gregory counters, however, that "we do vigorously dispute the proposition that only free-range or cage-free production is humane. We disagree with that view, and so does our scientific advisory committee. Caged housing systems protect birds from predators and diseases such as highly pathogenic avian influenca. Cage systems also may reduce pecking and other aggressive behavior, including cannibalism. The way eggs are handled in cage systems may also reduce the chance that the outside of the egg will be contaminated with feces, offering a food safety benefit. But to Shapiro's way of thinking, "the industry is out of step" with consumer attitudes. He commends the industry in making a move in the right direction in switching from 98 percent caged production to now 96 percent or 95 percent, but the vast majority of layers still live in a space smaller than a sheet of paper, he says. Animal rights activists are pressing for efforts to ban cages at both the state and federal level, but thus far, the egg industry has been successful in repelling them. In New Hampshire, cage-free measures were voted down in committee and then by the entire legislature; in Connecticut, a cage-free measure was defeated in committee; in Washington, a committee considering a measure decided not to take a vote; and sponsors of a measure in Arizona pulled the bill after visiting an egg farm there. The outcome of measures in California and Delaware were still undecided at presstime. Federal legislation, the Farm Animal Stewardship Act (H.R. 1726), has also been introduced that would require the federal government to use animal welfare guidelines in making purchasing decisions for the school lunch program, the military, federal prisons, and other government purchase programs that is in excess of current industry practices. The bill would require producers who supply farm-animal derived products to have space to turn around and extend their limbs, among other requirements. Asked to access the federal bill's chances, Steve Kopperud, senior vice president with Policy Directions, Inc., says "slim to none." He says it's very difficult to attack the industry in federal legislation because all of agriculture rallies in defence. Kopperud adds that at the federal level, animal rights is not a partisan issue, thus the power shift to the Democrats does not increase the likelihood of the passage of animal rights legislation. Because of the difficulty in passing federal legislation, animal rights groups are focusing much of their efforts in trying to ban confined housing for animals in largely urban states without an entrenched industry, Kopperud says. One obvious question is why the caged layer issue has become such a large one of late. In Kopperud's opinion, there are two primary reasons why. One is that animal rights activists have changed tactics and have been "attacking brand," thus companies hope that "by giving them something," such as a cage-free policy, the activists "will go away." He agrees with Gregory that the policy shifts to cage-free by companies "is not consumer driven at all." He also attributes the success of the cage-free movement to whom he calls the highly effective president and CEO of the HSUS, Wayne Pacelle. Pacelle is "very politically astute" and has made animal agriculture his No. 1 priority, Kopperud says. Kopperud also says that supermarkets are responding to what he calls the Whole Foods syndrome, but he thinks that is a misperception and a myopic sense of food policy because such a small percentage of consumers can afford to pay $3 per dozen for eggs. Asked how he assesses where the industry stands in the cage-free battle, Kopperud says "we are barely holding our own." Will the movement to more cage-free eggs continue? Yes, he says, if the industry allows animal rights activists to control the discussion. He adds that the industry needs to do a better job telling its story. Kopperud continues that U.S. food costs are currently 11% of an average consumer's income. "If that is a goal, then we need to shift our mindset dramatically," he says. Ironically, Kopperud says, a shift to cage-free layers or sows raised without gestation crates would increase consolidation "because only those large enough and rich enough could afford to make the transition." In Gregory's view, for all the publicity surrounding the switch of businesses and organizations, the percentage of total egg production is very small. Not that they aren't having an impact, but if Burger King requires that 2 percent of its eggs are cage-free or a university dining hall switches to cage-free, the impact is still relatively small, he says. But Gregory is nonetheless very concerned about the impact animal rights groups can have in the marketplace, because it's there, not in state or federal legislation thus far, that activists are achieving victories. On July 2, the CVMA Board of Governors reviewed the latest amendments to AB 1634, the California Healthy Pets Act, and moved from a co-sponsor to a neutral position. The bill was a major topic of discussion at the recent joint Board of Governors and House of Delegates meeting in Anaheim. During the joint session of the Board and House, then-CVMA President Dr. Ron Faoro presented a history of the bill, addressed the concerns that members have raised and discussed some of the amendments that were being considered. Mr. Mike Dillon, the CVMA legislative advocate, discussed the legislative process, such as how a bill travels through the legislature, how amendments are added, and the role of the CVMA in developing the language of the bill. He also reminded everyone that the CVMA, as one of the co-sponsors, had worked collectively with the other groups to shape the bill to meet the needs of all, including addressing the veterinary aspects of the bill. Change the spay/neuter age to six months (from four months). Any veterinarian could provide a letter exempting a dog or cat for an additional three months and could write a second letter for an additional three-month exemption (up to one year of age). Add an exemption for any owner to purchase an intact permit that allows them to own an intact dog or cat Any dog or cat that qualifies under this exemption would be limited to one litter per year. Allow any purebred dog or cat to qualify for an intact permit. The language requiring purebred dogs or cats to participate in a show or competition, be in training to compete, or to have earned a title would be removed. Add language that clearly states that veterinarians would not be required to report the spay/neuter status of dogs and cats under their care, or enforce the provisions of this bill. Dogs and cats must be spayed or neutered by six (6) months of age. 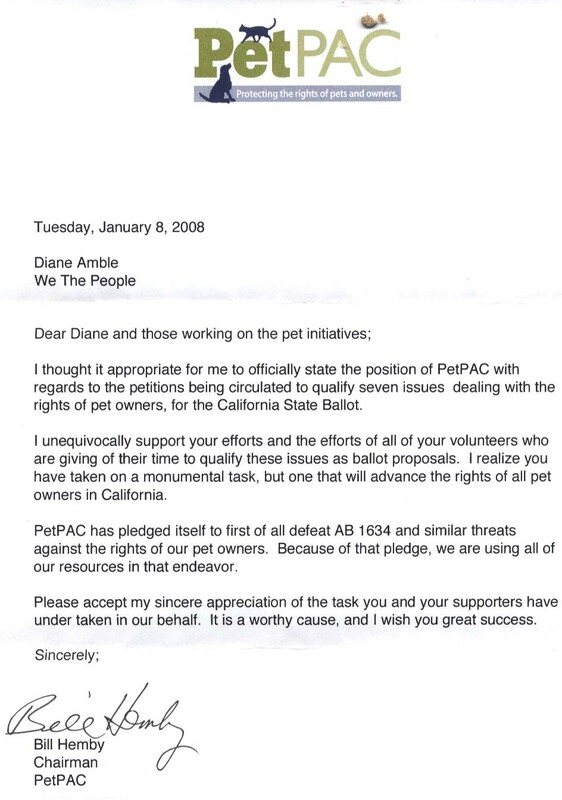 A veterinarian can write letters providing exemptions up to one (1) year of age. Veterinarians are not required to enforce the bill or provide information to a local animal control agency as to the spay or neuter status of a cat or dog. The Board felt that these amendments created a better bill, however, some issues remained unresolved. These components dealt largely with breeding restrictions that continued to be a problem for our membership. Therefore the CVMA's position changed from co-sponsor to neutral. AB 1634 is a good example of why the CVMA needs to be at the table on important issues. The CVMA was approached by the sponsors of the bill and asked to be a co-sponsor. The draft form of the bill required every dog or cat over four months of age to be spayed or neutered. There were no veterinary or medical exemptions. There were no requirements that the surgeries be performed by a California licensed veterinarian. And, there was nothing in the bill stating that veterinarians are not responsible for enforcing the bill. During the subsequent months of debate on the bill, the CVMA worked hard to improve this legislation. The CVMA appreciates the efforts of the author and the co-sponsors of this bill to address the importance of spaying and neutering dogs and cats and end the needless killing of animals in shelters. █Purebred dog ownership is being threatened in the State of California. 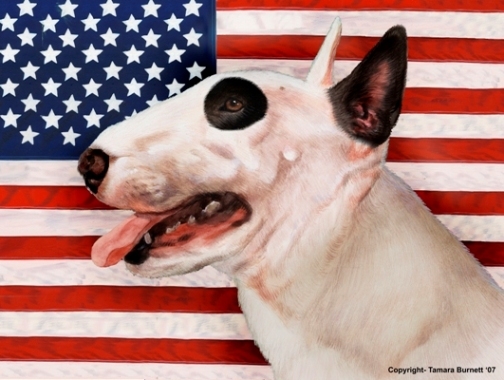 The AKC/Eukanuba National Championship is scheduled to be held in Long Beach in December 2007 and 2008. Although the AKC has considered making Long Beach their permanent home, Ron Menaker (AKC Chairman) says that enactment of AB1634 would make that impossible. 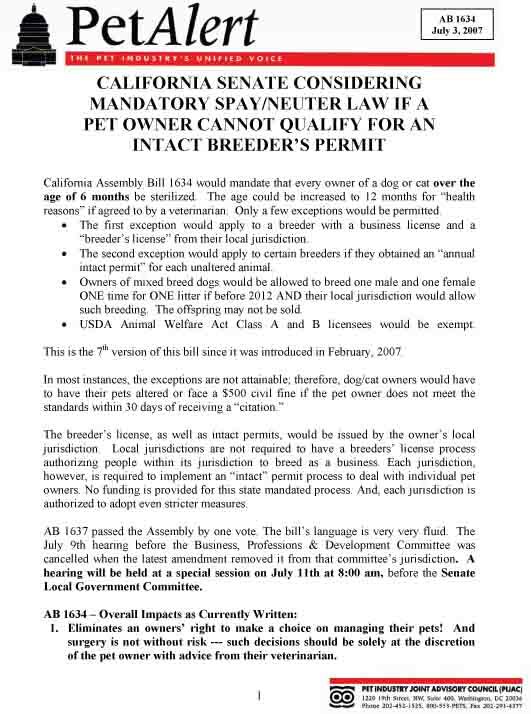 Last month in my Chairman's Report, I reported on a pending threat to purebred dog ownership in California: Assembly Bill 1634 would require the mandatory spay or neuter of dogs 4 months or older unless an intact dog permit is purchased through local authorities. Should this bill become law, I fear it could be a catalyst for other states. As the old saying goes, "As California goes, so goes the nation." As many of you know AB1634 passed by one vote on Wednesday in the full Assembly. Despite this recent set back, it's important to note that this vote was not strictly along party lines. Through our continuing efforts, we were able to convince 6 Democrats to abandon their majority party to vote against this bill in this Democratic controlled body, just as we were able to convince other Democrats to vote against it in the May 16th hearing when the Assembly Committee on Appropriations voted 10-to-6 in favor of the bill. It is vital now that California dog owners and breeders contact their State Senators as well as the Governor to express their opposition to this bill as it continues its journey through the California statehouse. While the sponsor of AB1634 has amended the bill five times since its introduction, none of the amendments make this bill an acceptable piece of legislation. AKC vehemently opposes AB1634 and will continue our strong opposition until this bill is defeated. The AKC/Eukanuba National Championship is scheduled to be held in Long Beach in December 2007 & 2008. Although we have considered making Long Beach the permanent home, I have communicated to both the Mayor of Long Beach and to Governor Arnold Schwarzenegger that enactment of AB1634 would make that impossible. █State Senator Joe Simitian (D-Palo Alto) announced today that he will hold a public forum in Palo Alto on Saturday, June 23, to discuss Assemblymember Lloyd Levine’s AB1634, known as the California Healthy Pets Act. “A lot of folks in my district have reached out to my office about AB1634,” said Simitian. “I want to give my constituents a forum where they can share their perspectives with me.” Simitian is a member of the Senate Business, Professions and Economic Development Committee, which is expected to hear the bill sometime in the next few weeks. Simitian will first hear invited speakers’ prepared remarks in support of and opposition to the bill. The floor will then be opened to public comments, where each speaker will have up to two minutes to present.